In my humble opinion, 2012 has been a pretty great year for the music scene, both worldwide and local. And as if I didn’t have enough to fill my already cluttered list of reasons as to why this year was A+, here’s another one, and it comes from the heart of sunny South Florida. 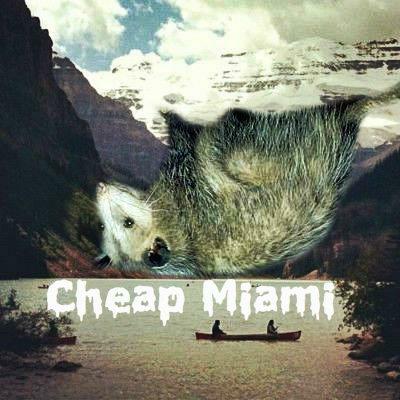 Cheap Miami is a new cassette distributing label, and they’ve already got a few of Miami’s favorite local bands signed with them. Before their first release party on the 29th at Kill Your Idol, we talked to Patrick Garcia, one of the founders of Cheap Miami, to get a more in depth look at this new exciting boost to South Florida’s music scene. So, the obvious question to begin with would have to be, why cassettes? Patrick Garcia: We feel as though the cassette, although archaic, is one of the easiest ways to produce and share music in a tangible format. What are some of your favorite cassettes you ever purchased or received, and do you think they played any part in your reason for wanting to distribute them? Patrick Garcia: Holly Hunts split with Viking Funeral is one of my favorites – as is the local TeePee tour tape from a couple years ago. These tapes, among others, were definitely a huge influence when it came to what sort of dent I wanted to put in the local music scene. How did this project originally come about? PG: My friend (whom I only know as Solace Fragment) runs a noise/drone tape label in Ohio called Solace Media Corporation – his label is what got my cogs turning and coming up with ideas about a tape label. I then met Michelle Granados, who’s the singer in Ex-Norwegian, and through our shared passion for music we just sort of jumped into it. Most of the bands under your label are local, but two are international-one from France and the other from South Africa- how did those two happen? Do you plan on having more international bands under Cheap Miami, or do you think you’ll be focusing it more on local acts? PG: I simply emailed them. I am a very big fan of garage rock, and those two bands are truly some of the best I’ve heard since early Jacuzzi Boys. So when we finally decided to start this label they were the first two bands we asked. We definitely plan on having more international releases – we actually already have another French one in the works. Pain Dimension – a band that plays with Dusty Mush pretty often. Tell us more about the cassette release show at Kill Your Idol. How many cassettes will be available? PG: We’re planning on having 100 tapes for each band (Gun Hoes, Whorish Boorish, Thee Holy Ghosts and the Dusty Mush/Future Primitives split). Tapes will be 5 bucks each. It should be a good night! KYI is one of my favorite venues and I think people sometimes forget that they have music acts playing there at times! In fact, Lil Daggers show there many years ago was one of the best! 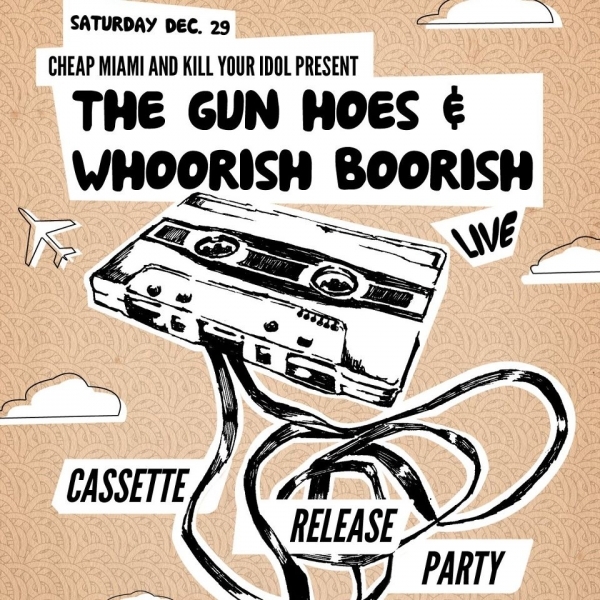 Will putting on shows like the one at Kill Your Idol be a main focus of Cheap Miami, or is the primary goal solely the distribution of cassettes? PG: Having the opportunity to showcase more local acts, whether under our distribution label or not, would definitely be an interest for us. Miami’s music scene has to be nurtured. One thing that I have personally always loved about cassettes, is the artwork. Who will be doing that, and will the bands be involved at all? PG: Michelle and I offer to do the art work if the bands dont have any, but aside from Dusty Mush with the Tom Pitts Acid Trip EP, no bands have needed our artwork as of yet! But I’ve always loved created the artwork for my own personal mix tapes and noise projects. Your style is so unique compared to other folks I’ve read stuff from. Thank you for posting when you’ve got the opportunity, Guess I will just bookmark this site.